In “Hard Choices,” the former secretary of state ignores or glosses over key aspects of her record on Iraq—including State Department responsibility for the country’s security assistance. Having co-authored a 2007 biography of Hillary Clinton, I know that Iraq is not one of her favorite subjects. But with the bloodshed and sectarian division now crippling Iraq, I wondered what her new memoir, "Hard Choices," had to say about a country that's long been a political minefield for her. The answer is not a lot. There is no chapter on its own for Iraq, like there is for Gaza, or Burma or Haiti. The discussion of Iraq is scattered throughout the 632-page book, and it is mostly about old battles. Clinton does not delve into the challenges she faced as secretary of state in 2011 as her department inherited responsibility for Iraq's security assistance when American troops withdrew. Instead, the book has made headlines for her admission, for the first time in 12 years, that she made a "mistake" when voting to authorize the Iraq war when she was still a senator in 2002. A closer look at what Clinton wrote—and didn't write—about that vote, about her views on the Iraq troop surge and about the country's ongoing sectarian strife is revealing. Clinton continues to misstate parts of her record on Iraq, while failing to address some of the tough choices she took as America's chief diplomat. Here's a refresher on the details, drawn from interviews and government records and reports on Iraq. 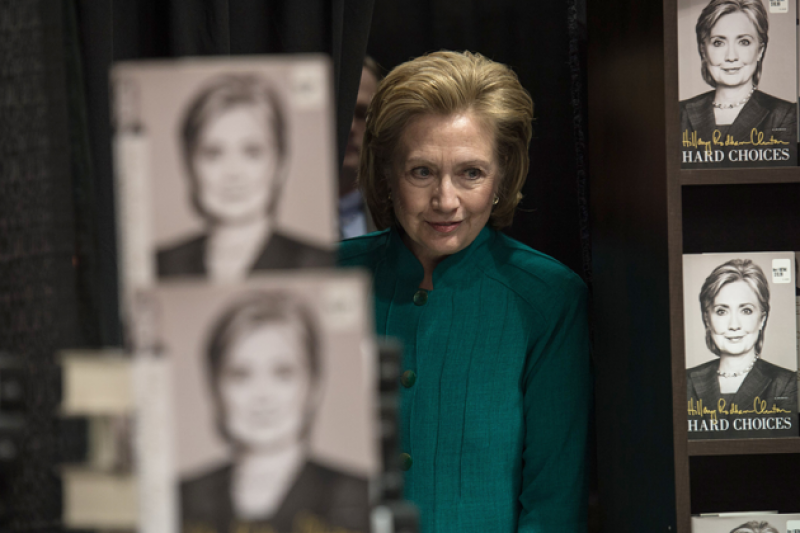 Clinton's office and the book's publicist did not respond to requests for comment. "My lack of confidence in the Bush Administration went back to the fall of 2002, when it was boasting of ironclad intelligence about Saddam Hussein's weapons of mass destruction. After weighing the evidence and seeking as many opinions as I could inside and outside the government, Democrats and Republicans alike, I voted to authorize military action in Iraq, if the diplomatic efforts, meaning the U.N. weapons inspections, failed." She also wrote that she "made the best decision I could with the information I had." In our 2007 book about Clinton, co-author Don Van Natta Jr. and I showed that she had never read what arguably was the most authoritative information available: the National Intelligence Estimate on Iraq. After book excerpts appeared, Clinton was asked in the first presidential debate with Barack Obama whether she regretted not reading the estimate. "I feel like I was totally briefed," she said. The estimate concluded that Iraq was rebuilding its capacity for nuclear and other weapons of mass destruction. But there were dissents within the report that turned out to be accurate. Clinton's colleague, Florida Sen. Bob Graham, then the intelligence committee chairman, had read the report. At a lunch three days before the war vote, he forcefully urged Clinton and fellow Democrats to also read it. Graham opposed the resolution for war. Clinton doesn't specify her pre-vote sources of information. But one person she didn't consult was Carl Ford, Jr. At the time, Ford was in charge of the State Department's intelligence bureau, which correctly reasoned in the intelligence estimate that Iraq was not rebuilding its nuclear capabilities. Ford, now retired, told me in an interview Monday that Clinton never consulted him. He secretly briefed a few Congressional committees involved with national security, but Clinton was not then a member of them. Clinton argues in the book that she really was voting for diplomacy, not war. That repeats a stance she made when she cast her vote, and it's one she continued to make in the following years. But the resolution she backed gave President George W. Bush wide latitude to go to war. Its title was unambiguous: "Authorization for use of military force against Iraq resolution." One of Clinton's Democratic colleagues offered an amendment favoring more diplomacy. The amendment's author, Sen. Carl Levin of Michigan, said his proposal would require Bush to return to Congress if U.N. diplomacy failed, and ask for another war resolution. Clinton voted against it. Opponents argued that the Levin amendment limited presidential authority, and it failed. But three of the senators who backed the amendment also voted for the war authorization. If Clinton had voted for the Levin amendment as well, her claims of wanting more diplomacy would be far more persuasive. On the Senate floor the day of the war vote, Clinton went further than any other Democratic senator—and aligned herself with President Bush—by accusing Saddam Hussein of giving "aid, comfort and sanctuary to terrorists, including al-Qaida." That position was unsupported by the National Intelligence Estimate, and it turned out to be not true. After the invasion, al-Qaida did gain a foothold in the country. Today, some of the worst violence in Iraq is driven by the Islamic State in Iraq and Syria (ISIS), an outgrowth of the original al-Qaida group. ISIS has grown in strength with a goal of forming a new Islamic state in Iraqi and Syrian territory. Along with many others, Clinton opposed the surge of troops in Iraq. The surge was widely credited with reducing violence and restoring stability in a country where the governing majority was Shia and the minority was Sunni. The reverse had been true under Saddam Hussein. In her book, Clinton says her decision to oppose the troop surge stemmed from her residual distrust of President Bush dating back to the war resolution. "Five years later," she writes, "President Bush asked us to trust him again, this time about his proposed surge, and I wasn't buying it." The problem, as she saw it, was that throwing more troops at the problem wouldn't work without a "robust diplomatic strategy" that went to the underlying challenges, including "the sectarian conflicts that were tearing the country apart." Clinton writes that the surge proved successful because its architect, Gen. David Petraeus, followed a more comprehensive strategy, as she had urged when he appeared before the Senate in January 2007. But her book doesn't address the surprising admission that then-Secretary of Defense Robert Gates says she made at an October 2009 White House meeting to discuss a proposed troop surge in Afghanistan. "In strongly supporting a surge in Afghanistan," Gates wrote in "Duty," his memoir, "Hillary told the president that her opposition to the surge in Iraq had been political because she was facing him in the Iowa primary." Gates found the exchange "remarkable," and quotes Clinton as going on to say, "The Iraq surge worked." The administration's point person on Iraq has been Vice President Joe Biden. Still, Clinton had significant responsibility for the relationship as secretary of state. Not only was she the country's top diplomat, but responsibility for security assistance in Iraq was transferred to the State Department from the Pentagon after American troops were withdrawn at the end of 2011. Iraqi legislators barred even a limited presence, something that hampered military training. There is nothing about this in her book. One former State Department official, who worked on Iraq under Clinton, said the omission was consistent with the experience of staffers: Clinton didn't devote a lot of political capital or time to the subject. As the announcement of the troop withdrawal played out, Clinton did appear on two talk shows to assuage concerns about the future security situation in Iraq. She told both questioners there would be a "very robust diplomatic presence" and continued security training, now under the auspices of her department. A program to school Iraqi police to fight terrorism and crime, run by the State Department, came under strong criticism by auditors and was drastically scaled back during Clinton's tenure, according to federal reports. The Baghdad Police Academy Annex was closed by 2012, and the American group that coordinated security with Iraq, then under State Department control, was faulted in a 2013 audit by the Pentagon and State Department for a lack of "clearly defined responsibilities" that put at risk "bilateral security operations with Iraq." The promised diplomatic presence was scaled back, too. Iraq experts in the State Department proposed to keep open American facilities in places like Kirkuk, but the plan fell by the wayside, according to the former official. The plan's purpose was to keep in contact with the increasingly disenfranchised minority under the country's Shia-dominated leaders, led by Prime Minister Nouri al-Maliki. Shortly after the departure of American troops, the country's top Sunni official had to flee to avoid being arrested. "The worry was that the Sunnis would feel abandoned," the former official recalled. In 2012, the new ambassador to Iraq, Robert Beecroft, was asked about Maliki's autocratic tendencies at his confirmation hearing. He said that working through disputes in Iraq was a "slow, protracted process" but the U.S. was working hard to "encourage" consensus and "we'll continue to do that as best we can." "The encouraging thing," he told the senators, "is that Iraq has not fallen apart." The sectarian conflict, which Clinton worried about in 2007, has grown worse since Maliki's re-election in 2010, according a recent article in the Washington Post. By October 2012, a few months before Clinton left the cabinet, a government audit found that the security situation in Iraq was deteriorating. Violence had reached its highest levels in two years, according to the Special Inspector General for Iraq Reconstruction. And Sunni terrorist groups like ISIS had "regained strength." Two years later, the group has assumed control over large chunks of the country. As for Maliki, Clinton's one reference to him in the book is part of a description of how Americans have helped his government rebuild Iraq's oil industry. But as she has been promoting her book around the country, the former secretary has chosen a more undiplomatic description. He "has failed," she told Fox News, and she no longer thinks he "is the person to lead Iraq." Editor's note: Chapters about Iraq from Jeff Gerth's 2007 biography of Hillary Clinton, "Her Way", co-authored with Don Van Natta Jr. were excerpted in The New York Times under the title, "Hillary's War."